Miami-Dade County Public Defender Carlos Martinez has tripled down on his opposition to members of the Miami Beach Crime Prevention and Awareness Group who testify in Bond Court to keep repeat criminal offenders in jail longer. The group is an ad hoc Facebook effort in response to concerns about crime on Miami Beach in general and, specifically, about repeat offenders that gather in Lummus Park on Ocean Drive that they say are harassing residents and tourists and posing a danger to the public overall. Yesterday, Martinez circulated a motion with the Eleventh Circuit Court objecting to the “unlicensed practice of law and lack of standing”. It appears to be a generic motion that can be used for any defendant coming into Bond Court. While it names group co-founder John Deutzman, it includes any member of the “Miami Beach Crime Stoppers” group, though that is not how the group identifies nor is it a formal organization. The Public Defender’s objections have escalated from a statement made by an assistant public defender in October, to two formal objections by the APD on Monday and Tuesday, to the motion circulated yesterday which indicates Deutzman’s actions are “a third degree felony”. The motion states: “Based on his behavior in past cases, [Deutzman] advocates for increased monetary bonds with explicit intent that bond be set so high that indigent defendants cannot afford to post bond, thereby depriving them of liberty." 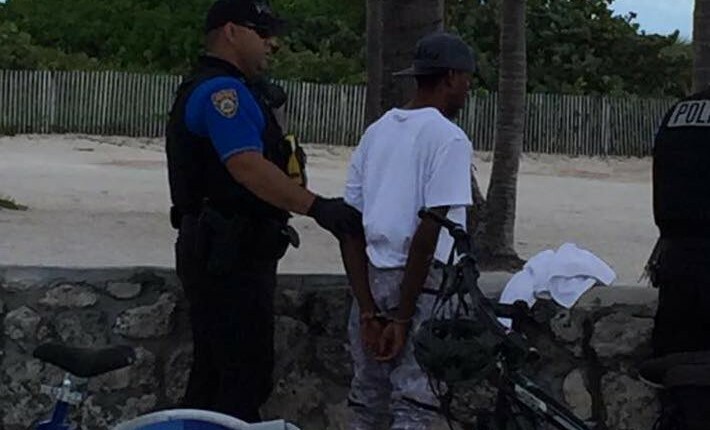 Deutzman and other Miami Beach residents started showing up in Bond Court after their research indicated that a number of the people that congregate in Lummus Park had been arrested more than 100 times, some for serious offenses like assault and robbery. They objected to cases being pled out there instead of going through the process to a status hearing and trial. Anecdotally, they report some successes on their Facebook page, with a number of the repeat offenders receiving sentences of 30 to 60 days and some being issued “stay away” orders. Those “wins” are what has gotten the attention of the Public Defender’s Office, which is charged with representing defendants who attest they cannot afford their own legal representation. Carlos Martinez is the elected Public Defender for Miami-Dade County. There are nearly 200 assistant public defenders who work under him, handling 75,000 cases each year, according to the Office’s website. Deutzman argues the caseload is so high that the assistant public defenders and State attorneys assigned to the cases do not have time to dig deeper into a defendant’s criminal history to ensure the community’s public safety interests are taken into account. He says he and other residents are focusing their efforts on those offenders with a high number of arrests in a twelve-month period and on the severity of crimes. His goal is increased jail time for repeat criminals as provided by Florida law in an effort to stem the tide of crime in the Ocean Drive area. Right now, he says, without consequences, there is an endless cycle of criminal activity by the same individuals. “Neither a lawyer or a non-lawyer can be advocating for increased monetary bonds with the explicit intent that bond be set so high that the indigent defendant cannot afford to post bond. Such use of monetary bonds is unconstitutional. The purpose of bail is not to punish the defendant nor to detain him in custody prior to the disposition of the case. A non-lawyer may or may not know the unconstitutionality of the positions he advocates because is not a member of The Florida Bar. That problem is one reason why the unlicensed practice of law is illegal. Making an appearance in court and advocating for a ruling in a case are part of the practice of law. Deutzman says Miami Beach has a good record of showing compassion for indigent individuals. “$1.5m in services for homeless, five cops, free ambulance service for homeless,” he says reciting a list of City services. “We’re already doing the compassionate part.” What he wants now is to add a layer of protection for the community. He says he works well with the State Attorney’s Office and he’s more comfortable with the status hearing and trial phase of the judicial system. In that “second phase,” he says, “We’re kind of covered with our concept of repeat offenders” with regular judges who have seen the offenders before and more time to prepare on the part of the State's attorney. He calls the Bond Court phase, “our weak phase” and, yet, he says, it is the most important, the “first line of defense”. If cases are pled out there with minimal time served, they never make it to the second phase. With Bond Court, appointed senior judges rotate in and out and the job is not always viewed as desirable. “I personally think that’s the most important job,” Deutzman says. “You see them first. I just wish we had one [judge] that would be in there” assigned on a regular basis to Bond Court. And that’s why he shows up, to ensure the knowledge of a defendant’s criminal history and that his or her impact on the safety and wellbeing of the community is considered. One of the initiatives the crime group supported was the hiring of a municipal prosecutor by the City of Miami Beach to take on the City’s municipal violations (the less serious crimes) to lift some of the burden from the State Attorney’s Office and to ensure a greater focus on keeping repeat offenders off the streets. It is a system that is already in place in a number of neighboring counties according to Miami Beach Chief Deputy City Attorney, Aleks Boksner. The City’s municipal prosecutor was hired with the start of the new fiscal year that began on October 1. Boksner says he is hoping to get the new prosecutor into Court by January. Right now, he is working to get the cases moved over to the City. The bureaucracy is like a big ship, he says, and turning isn’t easy. “It’s an effort to modify the business practices that have been so ingrained down here that no one has had the wherewithal to look at it from a different perspective,” Boksner says. Because of the multiple agencies involved, “It does take a bit of effort” to make change. For Miami Beach, he says, innovation comes naturally. “As a City, Miami Beach always grasps these new concepts, these new ideas. This is nothing unusual to us, but for most of the people they have one thing they do every day … When you insert something like this, ‘Wait a second, I don’t know if we can do this’ is the typical response.” Boksner says Miami Beach is “approach[ing] this as a benefit to all parties involved” allowing the State Attorney’s Office to prosecute serious State law violations with the City taking on the misdemeanor cases on a local level. “To me it’s a common sense concept,” he says. Everyone, though, seems to think the effort is worth it. As to the Bond Court judges, he notes, “Most are not elected. They are senior retired judges with different philosophies. That's why I wish it was just one person." Public Defender Martinez who was unopposed in his election for a third term last year is up for re-election in 2020. 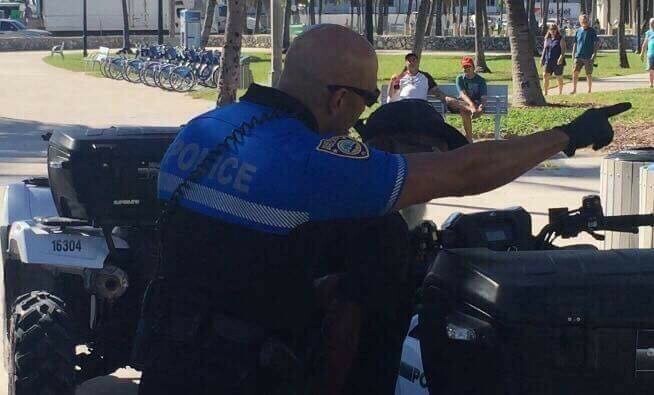 Photo: Miami Beach police officer makes arrest on Ocean Drive.